Order your sun with a side of surf. Palmy mini golf course is steps from your door. Unbeatable views from your living room window. Serve them up from pan to plate in minutes in your very own kitchen. Located directly on Daytona Beach. Kids will love the playground, mini golf and the kiddie pool. 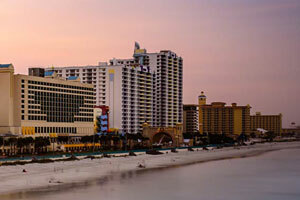 Grand Seas by Exploria Resorts offers private access to 812 feet of the world-famous Daytona Beach. Don’t bother unpacking once you get to your condo, just get changed into swimsuits, apply sunscreen and get ready to hit both of the outdoor pools with waterslides. Go for a swim or relax with a cocktail from the poolside tiki bar while the kids splash around in the children’s pool with waterslide. If the weather isn’t cooperating, head for the indoor pool, or pool-hop your way around all three pools, making the hot tub your final plunge. Fine-tune your putt on the mini golf course, while graciously accepting your loss to a four-year-old. Head to the fitness center for a workout while the little ones are occupied on the children’s playground. Studio, one- and two-bedroom condos sleep four to six guests. A family field trip to the Publix Supermarket is definitely in order – your full kitchen won’t stock itself. Recruit the kids to help bake your famous double chocolate brownies (and be the official taste-testers). If the kids end up with chocolate on their clothes, it’s not a problem. That’s what the on-site laundry facility is for! Up for a low-key night in? Flatscreen TVs with Cable have you covered. Gather everyone on the couch, put one of the kids in charge of the remote and another on snack duty and get ready to be entertained. There’s no shortage of excitement for sports fans in Daytona Beach. You will definitely want to check out the nearby Daytona International Speedway. It’s the “world center of racing” and has been home to the Daytona 500 since 1959. Check out the new race track; it was completed in early 2016. “The Jack” (Jackie Robinson Ballpark), home field for the Daytona Cubs is a must. Ocean Walk Shoppes and Movies features a variety of shopping and dining options along with a 10-screen movie theater. Point Break features beach apparel, towels and custom t-shirts. Get a new swimsuit at Maui Nix or a new pair of sunglasses at Sunglass Hut. Visit Daytona Beach Boardwalk for rides and attractions, two arcades, gift shops and snack bars. The family friendly Daytona Lagoon Waterpark will be a blast for grown-ups and little ones alike. In addition to water rides it also features mini golf, a mega arcade, laser tag, a rock wall and go karts. - The property is currently closed for renovations until 27 July, 2019.